What a lovely setting for a holiday – it’s so comfy and relaxing and every room has charming details. A perfect stay in a perfect location – we’ll be back (to go cycling). It’s a lovely place and very comfortable, everything we could need – sitting outside with that glorious view morning and evening has been a real pleasure. It’s all been such fun! This get-together has been long time in the planning and has certainly not disappointed – a wonderful house. This has been a wonderful family break and such a lovely place to stay – sad to leave. The accommodation is fantastic, comfortable beds, great showers, a fully equipped kitchen and more than enough amenities to keep the most active from being bored. Wow – what can we say?! A truly magical, beautiful place – thank you for our wonderful stay. A super-fun holiday in a beautiful house – thank you so much for a lovely break. A lovely, restful holiday. See our 5* TripAdvisor review (opens new window). A lovely, restful holiday. 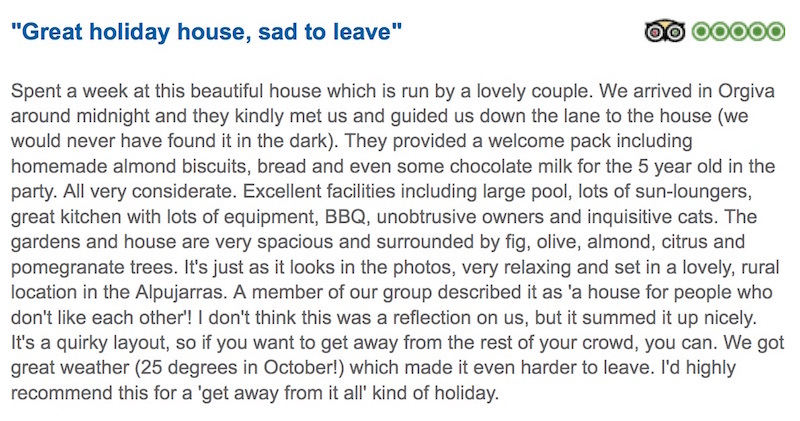 See our 5* HomeAway review (opens new window). Our annual get-together was made even more special by this wonderful house. From the moment we arrived we relaxed poolside and in the beautiful gardens. Thank you for a lovely stay in beautiful Almond Hill House. It has been a relaxing holiday for all of us – we enjoyed everything to the full! What can I say, it has exceeded our expectations in every way! The house is spacious, calm and comfortable and the outside area is amazing. All the course members were super happy and said it was one of the nicest places they had ever stayed in. Thank you for making our first retreat so special! There were three generations of us staying, ranging from one to eighty, and we all had a great time. See our 5* TripAdvisor review (opens new window). A really memorable holiday – we will definately return. 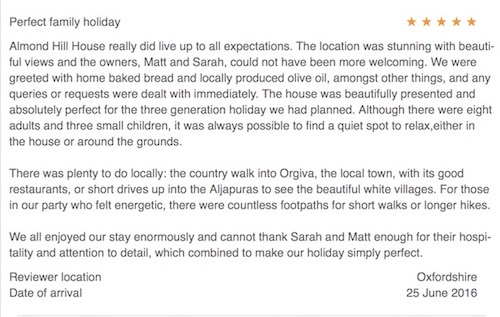 See our 5* Spain Holiday review (opens new window). Thank you for an awesome stay – the perfect base for exploring the Sierra Nevada and the little villages. Thank you for making the celebration of a ‘significant’ birthday such a memorable event. The house is extremely comfortable – it is so quiet and peaceful here and the area is superb for walking with stunning views. 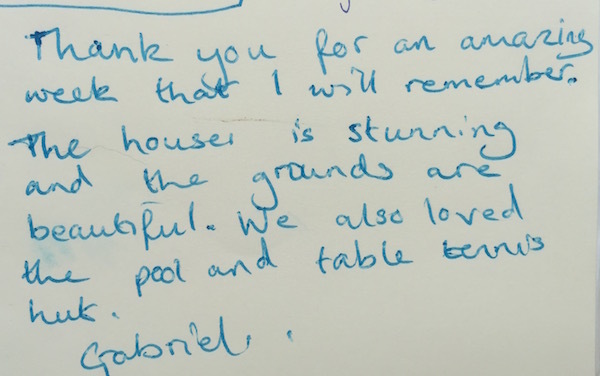 Thank you for one of the most amazing weeks of our lives – Almond Hill House is so very special in every way. It’s been everything we dreamed of, and more! We will remember it with great fondness. See our 5* TripAdvisor review (opens new window). We were a family of ten with an age range between 6 to 74. All of us had a lovely time in this beautiful location. The house is absolutely wonderful and the garden is beautiful – a stunning spot. See our 5* TripAdvisor review (opens new window). Thank you for a lovely stay. Our family enjoyed the area a lot; the walk between the white villages, a trip to beautiful Granada where we enjoyed the best tapas – everything was perfect. We’re looking forward to coming back one day. Thank you for the most wonderful week, it was just perfect. The house has beautiful touches with a feeling of spaciousness. A great location to explore Granada, for spectacular horse riding in the Sierra Nevada…or just to hang out. Moorhouse Marauders cycling group: Loved the place, the local restaurants and weather. We left wanting more and are enriched from the experience. See our 5* TripAdvisor review (opens new window). Lovely house, very well-equipped and spacious for our group of cyclists – we found the area stunning! The old farmhouse is full of character and comfort in such a beautiful setting – wish we could stay longer! We have had a wonderful two weeks – we will miss the peace and tranquility. All our group had a wonderful time – the best place we have every stayed. Thank you for a lovely family holiday – all ages from 7 months to 60+ had a wonderful time. It was a great base for visits to Lanjarón, Pampaneira, Granada and the beach. 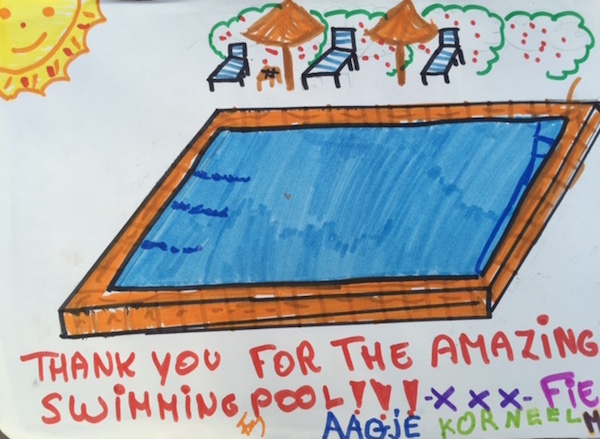 We had a fantastic time making full use of the pool, the table tennis table and barbecue and we all slept well due to the good quality beds and very quiet air conditioning in the bedrooms See our 5* TripAdvisor review (opens new window). The view from our bedroom has to be one of the best views in Andalusia, looking out on the amazing Sierra Nevada. The location is so tranquil that by the next morning we were already feeling totally relaxed. See our 5* TripAdvisor review (opens new window). Thank you so much for our amazing family holiday. We don’t get a lot of time together so when we do, it’s great to have such a beautiful place to spend it together. We look forward to making it a third time! We have really enjoyed making this our home for the last week or so. The peace, tranquility and easy feel of the house have helped us to truly relax. It’s our 5th visit to the area and probably our most enjoyable. A fantastic family holiday thoroughly enjoyed by all – Almond Hill House was ideal for all our needs. Highly recommended. I don’t think we were prepared for how fabulous Almond Hill House turned out to be! Everything wonderful from the charming rooms to the unexpected goat herds over the pool wall. A piece of heaven overseas. See our 5* TripAdvisor review (opens new window). Thank you for a wonderful relaxing week. What a beautiful house – so well-equipped and comfortable. The pool has been brilliant for both children and adults. This holiday has been very special for all of us. Absolutely fantastic week here – such an amazing place and location. The surrounding area is just stunning; snow capped mountains to white villages and laid back beaches. All in all a fantastic holiday and we hope to return soon. We’ve enjoyed your beautiful house and garden. The place is so nice we barely went out! So we must come back to see more of this area. We had a wonderful ten days over Easter – the weather was perfect. The pool is gated so perfect for children. We had a super time and can thoroughly recommend it! We have rented many houses over the last two decades and this is one of the best. We have enjoyed ourselves enormously. See our 5* TripAdvisor review (opens new window). Thank you for a wonderful stay – all feeling very relaxed after a great week. 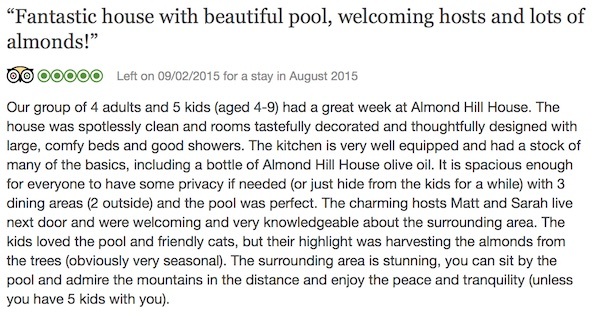 We will recommend Almond Hill House. As seven enthusiastic cyclists we were not disappointed with Almond Hill House and the beautiful area. We can recommend cycling to Trevelez and Salobreña on the coast…perfect! The pool was also perfect for cooling off after a long day in the saddle. Local produce (from the grounds) of lemons, olive oil and pickle were amazing. Thank you again for our beautiful family reunion we had. Thank you – you have made our holiday – it’s been a treat to stay here. The house is gorgeous – the decor, facilities, views and location. We had two days of walking from the house to Lanjarón and from Capileira to the adandoned village – both with spectacular views and wonderful mountains and wonderful flora and fauna. Coming at this time of year, the weather was perfect for walking. We’re sorry to be leaving! See our 5* TripAdvisor review (opens new window). First time cyclists in the Sierra Nevada. One route was crossing Cerro Camacho descending to Castell de Ferro – perfect beach for a swin and lunch. After days of cycling it has been really enjoyable with the pool and garden. Almond Hill House has been the perfect holiday location for us. Almond Hill House provided a perfect relaxing environment to sit, talk, drink, swim, read and have a wonderful holiday. Our days were spent fruitfully providing excellent evening meals from local ingredients – the fish in Orgiva market was lovely – fresh and local. We foraged for wild figs, almonds, small tangerines and wild herbs. Our stay has been really memorable. See our 5* TripAdvisor review (opens new window). It’s been an idyllic retreat and exactly what we were hoping for. We all loved the house, garden and pool, it has been a wonderful place to relax. We especially enjoyed the privacy and comfort of the completely separate suites. Our best excursion was a guided tour of the Alhambra and Generalife which was superb and worth every penny. Both are absolutely enchanting. We had supper in the Parador at the heart of the Alhambra looking out over magnificent gardens. See our 5* TripAdvisor review (opens new window). We do not normally return to the same place, as life is too short, but we had a wonderful stay and would be very keen to visit again. See our 5* TripAdvisor review (opens new window). We all had a wonderful time in your lovely home, the weather has been fabulous. A memorable holiday for all of us. Thank you for a wonderful stay at your beautiful house. What a wonderful base this is for a holiday – something to treasure for everyone. The old farmhouse is just like a Tardis and absorbed our five families perfectly. Thank you so much for such a special place – it really is quite difficult to leave! We truly enjoyed this holiday – not only the lovely and tastefully decorated house but also the great location – and views from the garden will always stay in our memories. We had a great time hiking, running and biking – and lazying around the pool. 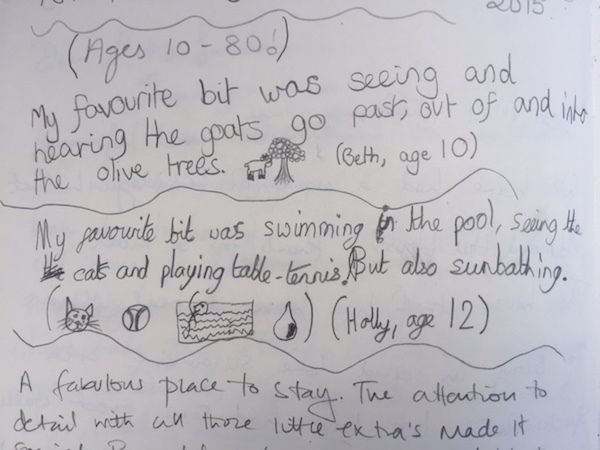 We had a wonderful stay – really enjoyed exploring the local area and especially liked visiting the towns described in the Visitors’ book. The children absolutely loved the pool. Thank you for the homemade bread and extra special touches that made the visit perfect! Owners Direct review below. We’ve had a fabulous week in your lovely house. Many thanks again – it’s been wonderful. We had a fantastic week in this perfect rural retreat. Walked through olive and citrus groves down to the river and over to Lanjaron which has a fantastic setting – the terrace at Hotel España feels like something out of a Hemingway novel. We love Spain but this is definitely one of the loveliest places we have stayed. A special week! Where do we begin? From start to finish you have made our holiday one we will never forget! 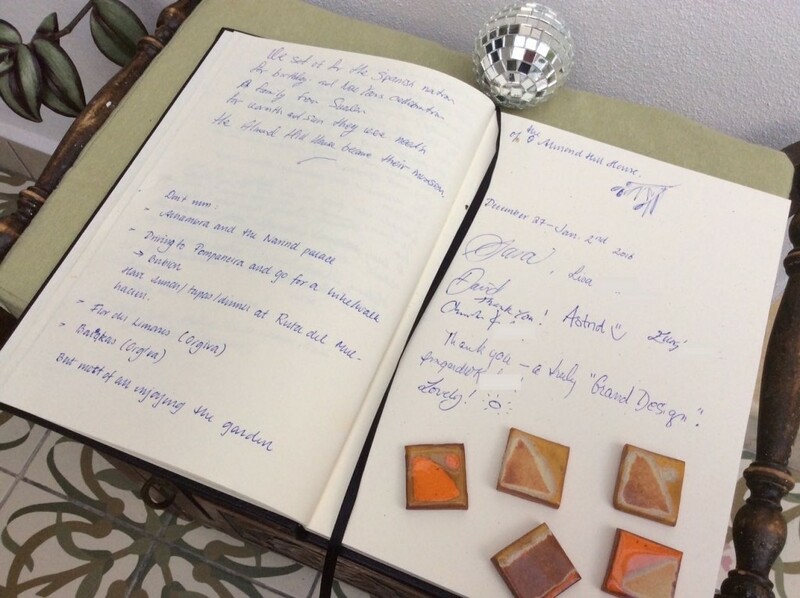 Your wonderful welcome and thoughtful gestures of fresh flowers and home made olive oil made us feel right at home. The house was just perfect for us. The kids loved the ‘yoga hut’ and the olive and lemon groves. We all loved our trip along the goat track into town. The house is so perfecly located for day trips for tapas and ice creams. If we had one regret it would be that we didn’t avail of your suggestion to book the chef to cook here in the house for us sooner. We had the most wonderful evening enjoying their fantastic food (and their company!). It was a really memorable evening which we will always remember. The whole week has been awesome. The kids loved it, the adults loved it. We will definitely recommend you and tell our friends about your lovely oasis. TripAdvisor review below. We have had a really lovely stay, thank you – the house is delightful. Our final evening sat by the wood burner, listening to the final calls of the birds as the sun goes down. We’ve had a lovely and lively time – all ten of us spanning ages from 4 to 68. Highlights were of course the Alhambra but surprises included the caves at Nerja, the white villages and a very productive ceramics class. A real treat having fresh lemonade and also orange juice from the stall down the road. A beautiful setting and one we’d all love to return to. Great olive oil too! Fantastic holiday, we have had a lovely time. Lemonade made with fresh lemons on the trees. We met goats and their herder on the goat trail, the kids went swimming – even in March! It was wonderful exploring the local villages and cosy nights in playing board games in front of the fire. And wonderful tapas, we will be back. Thank you – a truly ‘Grand Design’. 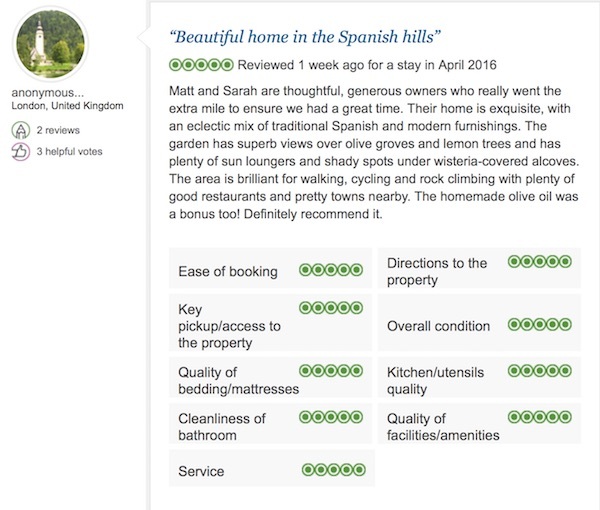 Don’t miss the Alhambra; driving to Pampaneira and going for a hike to Bubión (have lunch at Ruta del Mulhacén); Restaurant Flor de Limonero and Baraka – but most of all, enjoying the garden at Almond Hill House. Lovely! Thank you for a lovely couple of weeks at beautiful Almond Hill House. The house and gardens are a perfect base for our multi-generational holiday – ages 75-5. Very peaceful and beautiful views. The children loved to collect the almonds which were made into a lovely birthday cake in the very well-equiped kitchen. Granada was lovely as ever. A lovely holiday at a beautiful place. We hope to return. Beautiful view and garden, fantastic hacienda and pool. Everything has been perfect and very relaxing (except the mountain biking, which is world class). Hasta la Vista – we hope! Lovely, much-needed week relaxing and exploring the area. We can highly-recommend a much-tested ‘sangria-by-the-pool’ formula. Lovely hosts and nothing left wanting. TripAdvisor review below. The whole family had a wonderful time and we can’t wait to return. Almond Hill House is the best holiday location ever! TripAdvisor review below. We’ve had a wonderful time at Almond Hill House. Your hospitality, the swimming pool and the BBQ have all helped us have a great time. It is an amazing house with a great swimming pool. We have enjoyed the different cosy terraces and little shady corners around the house. It was a pleasure meeting with great hosts who gave us an immediate feeling of being welcome. We loved the whole area; the mountains and the lovely beaches. We have been climbing and the next day enjoyed the beaches for scuba diving and sunbathing. We have been twice to Granada; a great city with amazing history. It was a great holiday – thanks for the hospitality: the cookies, grapes and bread. One fantastic holiday for us all, the most delightful place we have ever stayed in. We’ve had a fantastic time here; the property and grounds exceeded our expectations, it has been just the most beautiful location to relax and have fun – either side of the Granada wedding! A fabulous place to stay. The attention to detail with all those little extras made it special. Beautiful views, very comfortable and loved the pool area. We have had a very happy week together with lots of great outings to the surrounding area. Pueblos blancos very pretty – great evening spent eating delicious tapas. Perfect family holiday – everything we could have wished for and more, fallen in love with the area, hope to come back – thank you! ps: comfy beds such a treat. We have had a wonderful holiday here at Almond Hill House. The house itself has been a real pleasure to stay in and the surrounding area is spectacular. We have had some great walks with the children while grandparents relaxed with books and coffees in the village cafes. The highlight for us parents has been that the children absolutely loved their holiday. Thank you so much for your beautiful house, Our family has enjoyed this week tremendously and a lot of it has been due to having a fantastic place to call home for a week and your extraordinary hospitality. So many special touches: the homemade jams and bread, stocking the refrigerator upon our arrival, info about the area, use of toys, towels and umbrellas for the beach made this a great holiday. We loved exploring Las Alpujarras and all of your suggestions worked out great. The walk down the mountain through the villages was a real highlight, but we also enjoyed a day trip to the beach, the Taha villages (with a side-trip to a lovely waterfall on the way past Pitres) and Órgiva itself. The kids totally loved your pool and the visits from your kitties. A wonderful and memorable vacation. What a wonderful house you have here – full of charm and character. Perfect for all the family with some excellent details: sun umbrellas, extra towels, swimming pool toys, and board games. Thank you for the olive oil, free rein of your fruit trees and the local advice. We loved the local towns and trips to los pueblos blancos and Trevélez. A real find was La Junta de los Rios near Otívar – a gorge with beautiful pools and waterfalls. A fabulous holiday! It really was a magical week – and so relaxing. Thank you so much for our wonderful stay – we returned to London wishing so much that we could have stayed longer. Almond Hill House is so beautiful and had everything (& more) that we needed. The gated pool was so useful as we could relax knowing Martha and Tate were safe. We really hope we can come back next year as there’s so many amazing bits we didn’t get to visit. I’ll be recommending your house to any friends in need of the perfect relaxing holiday. A lovely house enjoyed by adults and children alike. The securely gated pool, high chairs, cots and baby alarm were greatly appreciated – as was your unobtrusive help when needed, your delicious olive oil, oranges and lemons. For me (the main cook) the big, well-equipped kitchen was a real bonus. We loved this house and its grounds – it’s just as described on the informative website.